After 20 years, the flimsy plank in the library used to post doctoral theses at Campus Norrköping has become too small. The task to create a better solution ended up on the desk of Mats Nåbo, teacher of design at the Department of Management and Engineering. His posting door is now ready to be taken into use. The tradition of posting a thesis is reputed to have arisen with Martin Luther, who in October 1517 nailed his 95 theses to a door at Schlosskirche in Wittenberg. This was his way of inviting disputation, a discussion about the contents of these theses. Despite the rise of the internet within the academic world, the tradition of nailing up a thesis remains, in different forms at different universities. 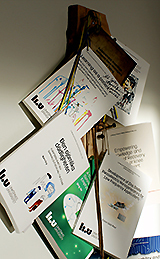 The various departments at LiU also use different solutions. The somewhat deficient plank attached to a flimsy wall, which just happened to be located in the quiet section of the library on Campus Norrköping, is no longer up to it. A better, and – most importantly – common location for all theses was needed, thought the Facilities Management Office, and commissioned industrial designer Mats Nåbo at the Department of Management and Engineering. 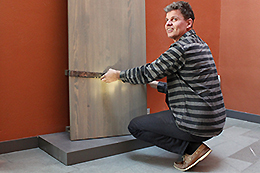 He passed his drawings to Tomas Larsson at the LiU woodworking shop, whom Mats Nåbo considers to be a talented carpenter and excellent teacher. Tomas created the two doors with a waxed grey surface. A smith manufactured the fittings, and the doorway was completed just a few days before Xmas, mounted at the Bredgatan entry. “It’s very satisfying to get to create things,” continues Mats Nåbo, from the Division of Machine Design at the Department of Management and Engineering, where he teaches industrial design. He has also designed the interior, ceremonial staff and medal that are components of the Commencement Ceremony at Linköping University. 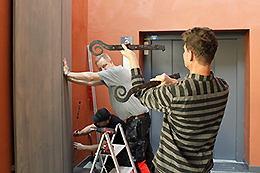 The initiative for the new posting doorway was taken by the library personnel, and has been carried out by the collegiate heads of department at Campus Norrköping, one of whose members is the head librarian. The group has participated also in the conceptual design work.